This is a great program for the iPad. I have used it to write all my orchestral compositions. The sounds on there are so natural and actually sound like an orchestra. My only wish would be to add the following sounds: more pipe organ voices, alto horn, Wagner tuba, saxophones that can actually blend with other winds for concert band writing, a more natural-sounding vibraphone and marimba, and crotales. I would also appreciate a contrabassoon that could hold onto notes for longer. Other than those requests, this is the best value for money! Please do a fix update having trouble when wanting to share my work to other apps, it freezes and don’t get the option to what app to share it I have to reboot all the time and sometimes doesn’t work but yeah other than that great app. I have spent some mega bucks on some big name musical daws and sound packs when many different kinds of music are represented in the this paid version. Seriously, with the small price you get some great sounds. When heard about this at first, I was like ok it would just be another throw away freebie piece of crap but tried the free version and was amazed. I was even more amazed at the cheap price to go to pro! This app plays well with others and works quite well with my midi keyboard which I can not say about some many high end other apps. Definitely worth it even if you only like 1/4 of the styles offered. Works on my iPad Pro and actually has a sizeable keyboard and pads that works great on my small iPhone 8, as well! Not sure how many complicated DAWs I've bought and tried. But this one is simple, useful and when needed can be very detailed when dynamics are needed. You can't go wrong. This is the ONLY music app I have tried that does not have latency issues when using Bluetooth headphones/earbuds and the Bluetooth Korg MicroKEY Air. I’ve used this app since iPhone 4 came out and it has never disappointed me. I have purchased every addon instrument available so far and absolutely love working in this app. It’s easy to use and hard to master so the the advanced user will have just as much fun as the novice that picks it up. Strange thing I noticed the other day, I also use FL Studio Mobile 3 and it would appear that their previous iteration FLSM 2 was almost an exact clone as far as interface goes... was this app the model that t was made after because o believe Music Studio 2 was out before FLS but idk. Just saw some old screengrabs and was like, what!?!! It looks like Music Studio!?! Anyway keep up the awesome work! Keep adding instruments and drum kits! Is there any plan to add on Vocal Processing/Pitch correction in-app? Or adding an actual synth that can be programmed in app? Just curious I am fine with IAA/Audiobus’n into Music Studio anyway! Great app!!! I think it is not user friendly in that my wife and I downloaded it. We tried to play the piano but as soon as you hit any note if echos five or six times. 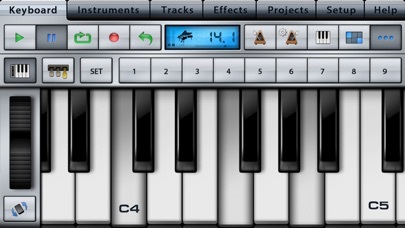 There should be an easy way to get the keyboard to sound like a regular piano. We have looked at effects and tried numerous things but the piano notes still echo several times after each stroke. Any reason why this is so difficult to figure out? Can’t import existing MIDI files! This is just my initial attempt to do anything! Not worth the cost. Can I get my money back? I’d put no stars, but it would not let me! Latest, can’t edit events! Some more instruments needs update! But I like this? Yes! I love this app and have been using it for years, but have a few suggestions that could make it even better. 1. A simple “clear trash” button for the new trash folder is desperately needed. 2. 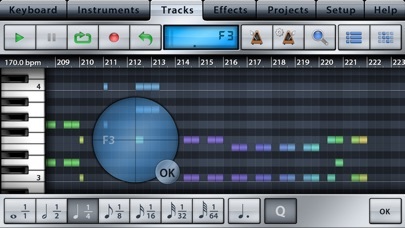 An auto tune feature for audio tracks. 3. A way of making sustained notes crescendo and decrescendo. 4. The ability to change tempo within a song. Thanks and keep up the great work! Add some Pitch change and auto tune!!! I am a rap producer that uses this app. A lot of rappers request to have their voice auto-tuned or pitch changed, but I always have to tell them no. Please add those effects because if not, I will have to get another software. Thanks! Con un interface Tascam y MUSIC STUDIO tengo un estudio de grabación fantástico, y la facilidad con el Ipad es que no necesito ningún software adicional. Buenísimo. 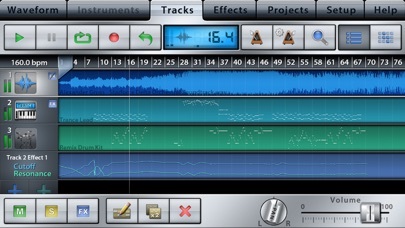 By far better feel than any other music tool especially garage band. You have a full control feel to it and it operates that as to a few major software programs combined . Do Not Use! Waste of money. Not iPad compatible, and completely un-user friendly. WASTE OF MONEY!!! This app is the gold standard for function and solid developer coding and support. The interface may look a bit dated but this app WORKS and works near flawlessly. A great value and deserving of support. The midi export/import functionality is top notch. The only complaint I have is the wireless server option. I feel like that is not needed and we should be able to toggle it off. I am normally not one to produce a full track on my phone, but if I need to this is a wonderful app for on the fly projects. It's also universal. On the iPad it stands up to apps like Cubasis in terms of functionality. It does not have the professional tools like Cubasis. The built in effects are decent and you have the option of using third party apps. It is it a fraction of the price compared to the competition. Much better than using GarageBand. One thing it is missing is built in synthesizers, but it tries its best with decent sounds. I have to say I'm impressed with this app! It has a lot of useful features such as built in midi instruments (and a lot to choose from too) as well as audio tracks to record from a microphone or line in. I really like the Inter App Audio support so you can record audio from other music apps and virtual instruments you may have installed on your device. Here's why I couldn't give it five stars: when I record audio tracks, it will record the wave, but it won't play the sound when I play back my recordings. I can't get the audio tracks to "play" even though the waveform is there. Is it something I'm doing wrong? Or is it a glitch that needs to be updated? I can't figure it out and it's driving me crazy because I really do like this app. I just wanted to bring this problem to someone's attention just in case they're having the same problem. when are the next updates? I've had this app for at least 3 years. One of the only apps I use consistently ever since I got it. Just get it. It’s my bread and butter of jotting down ideas in a multitrack environment. This is a very good music app! I love that it is fun and easy to use. However, it would be great if you could make it compatible with Windows. Don’t get me wrong- having it on a mobile app is great, but it would be much easier if I had the ability to open it up on my laptop and be able to work on a song there too. I’m currently only able to use this app on an iPod touch 6 gen, but the screen is so small...I don’t know, it’s just a thought. Awesome app though! Have used this app for almost 4 years now!!! Great for all my music needs. It really amazes me how far I've gone with just this app alone!! I've come to about 300 projects thus far!!! This app offers a lot of features desktop software provides with a abundance of instruments and beats for any style I'm composing. I absolutely love the power I hold when I open this app. It's my main studio as a young composer and probably will be with me for years to come. If you wanna hear what you can do acoustically with just an iphone 6plus and this app... go to itunes and check out my Hawaiin CD - Danny Johnson No Ka’u Mau Mo’opuna-Recorded , mixed and mainly engineerd in my bedroom ! A little finesse and some help mastering but its all Music Studio Acoustically recorded! Aloha from Maui! I’ve been experimenting with this app and it really met up to its standards. I would recommend more instruments in this case since I’ve already got a bit tired with using all of them. However I am definitely excited to see what I can do with the music box added recently band I await for more updates. ProTools yeah I own it & use this App. As stated recently calling this an app doesn't do it much justice, I write record import export mix edit do timing & pitch adjustments although I have perfect pitch!!! Yeah me… still sometimes you need a little tweaking. You go in & change individual notes Length pitch timing on real instruments as well as software instruments. Best Import Export functions available hands down on any app I've used… It also works with your other music apps. Plus you can write anywhere edit anywhere... so much more to be said! Thanks: PUNK INC.
Music Studio is still my favorite iPhone DAW, I’d even say my favorite iPhone music app. Even though Garageband continues to improve, and BeatMaker 2 has a few more features, I use Music Studio far more often because of the MIDI capabilities: import and export MIDI, and inter app MIDI routing. Also, the inexpensive orchestral sounds are some of the best for the iPhone. If you are new to Music Studio remember that you’ll likely need to turn the reverb down or off on each track. Been using this app for more than a year. It is quite powerful - I've composed many pieces on it. Most of the instruments sound great, a few aren't great, but I can always import my own. This is an essential tool to capture and develop songs in multiple genres. I can't figure out how to use the audio function with amplitube or amp kit. The tutorials have no guidance at all. I got the full version, but I guess it's only for mixing and inserting wav audio. Use to be able to share songs to my soundcloud..Now it loads all the way through then says "oops something went wrong" "http error"
This app has it all, very authentic instruments, very easy to create, record and edit. Worth every penny! 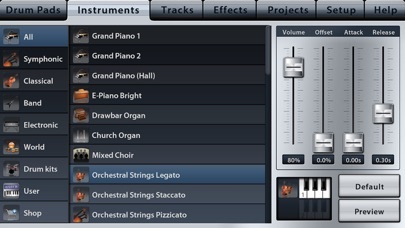 Music Studio is a great music production software package. I’ve been using it for a couple years and have been pleased with the results. But it needs an update, more specifically it needs an updated mixer with automation. So, do I continue to wait the the update that has been promised for over a year, or do I migrate all my work to Cubasis? 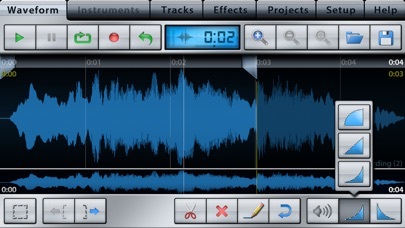 The limitations of mixer, especially for a final mix, is the biggest issue for an otherwise great app. Great but where is the Bluetooth? I bought this so I could play and write in my bedroom. I thought I would fly the tracks through my bose soundlink. I was shocked that it only plays through my dinky phone speaker. It is obviously very powerful and I like it, but really bummed about playback. Maybe I am missing something? Oh well. I like it BUT!!! I purchased this 7 years ago and then forgot about it because I wasn’t using my iPad for audio. But now I’m finding it very handy for recording a classical guitar album, as I can record tracks at home and edit them on my commute (by ferry). I especially appreciate that I can specify which channel gets recorded from my usb interface, edit waveforms with scrub, apply a pleasing reverb in real time, and access all files through a browser on my laptop. The EQ plug-in is not worth much but it’s easy enough to transfer audio into hokusai audio editor where the eq and scrub are superior. The included instruments are sample-based but one can sequence to others via AU. This app was great until they put the trash folder on, now you have to delete every file TWICE, takes hours to do , EXTREMELY Inconvenient. Its already bad enough you have to delete every file one at a time. I have spent some mega bucks on some big name musical daws and sound packs when many different kinds of music are represented in the this paid version. Seriously, with the small price you get some great sounds. When heard about this at first, I was like ok it would just be another throw away freebie piece of crap but tried the free version and was amazed. I was even more amazed at the cheap price to go to pro! This app plays well with others and works quite well with my midi keyboard which I can not say about some many high end other apps. Definitely worth it even if you only like 1/4 of the styles offered. Works on my iPad Pros and actually has a sizeable keyboard and pads that works great on my small iPhone 8, as well! Hands down the best studio app ever!!!! Only thing is I hope the update comes quick for IPhone X support. But I think you guys are doing an amazing job. I can leave my laptop home and use this!!! I love it!!!!!!! BUT PLEASE UPDATE THE APP FOR IPHONE X!!!!! !